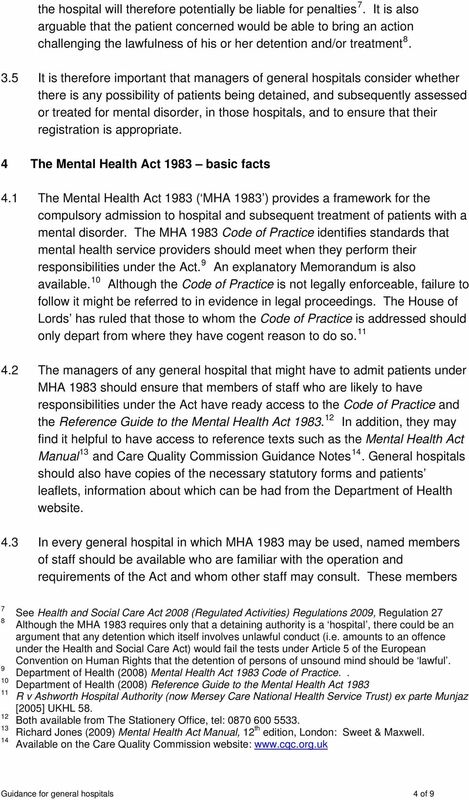 Download "Use of the Mental Health Act 1983 in general hospitals without a psychiatric unit"
1 Use of the Mental Health Act 1983 in general hospitals without a psychiatric unit This guidance relates to England only Previously issued by the Mental Health Act Commission; revised April Introduction Many general hospitals 1 use the powers of the Mental Health Act 1983 (MHA 1983) to detain a small but significant number of patients 2. 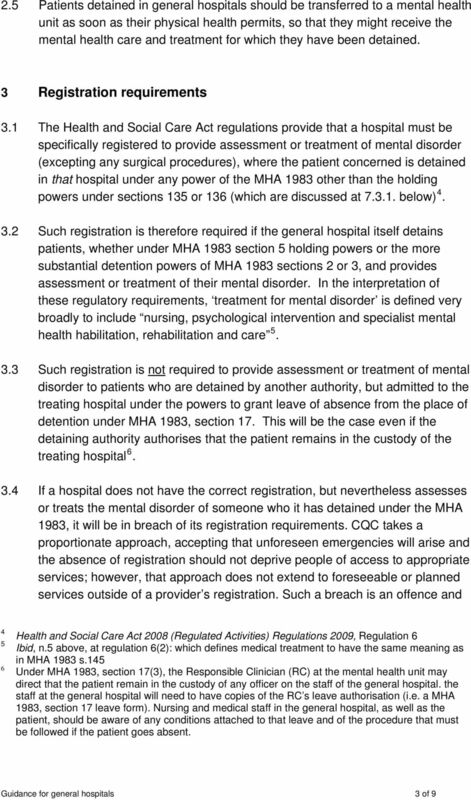 This raises two connected areas of concern: The registration system for health and adult social care requires that any hospital using the MHA 1983 to detain patients must be specifically registered to do so. 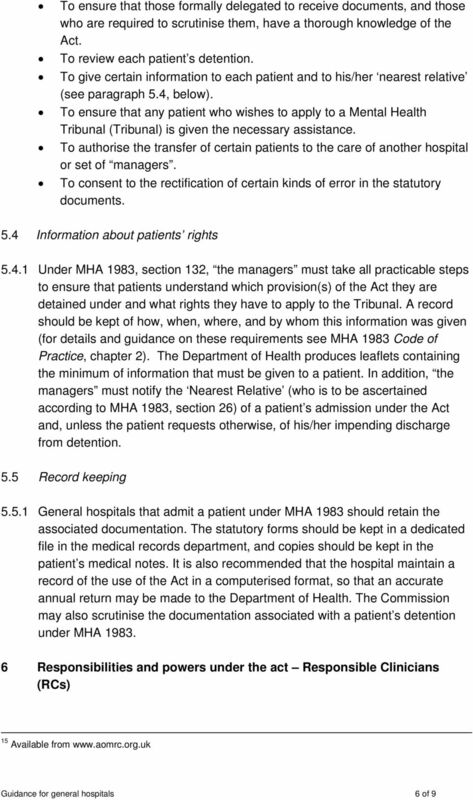 The detention of a patient under the MHA 1983 by a hospital that is not specifically registered to do so will be a breach of that hospital s compliance with their own registration requirements, and may call the legality of that detention into question. Where admissions under the Act are infrequent, Trusts may have difficulties in ensuring that the obligations, entitlements and safeguards set out in MHA 1983 are observed, regardless of their registration status. It is crucial that the necessary arrangements are in place, and this Guidance Note outlines some of the key responsibilities and powers. 2 Defining the detaining authority 2.1 Section 17 leave. 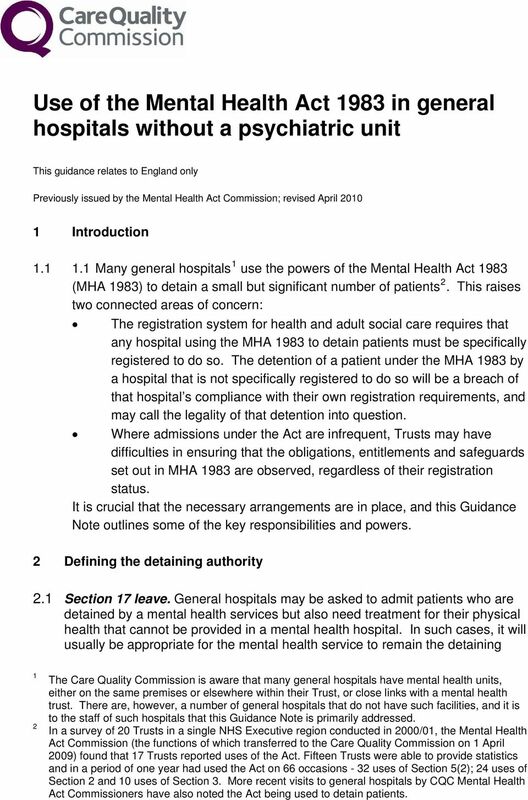 General hospitals may be asked to admit patients who are detained by a mental health services but also need treatment for their physical health that cannot be provided in a mental health hospital. 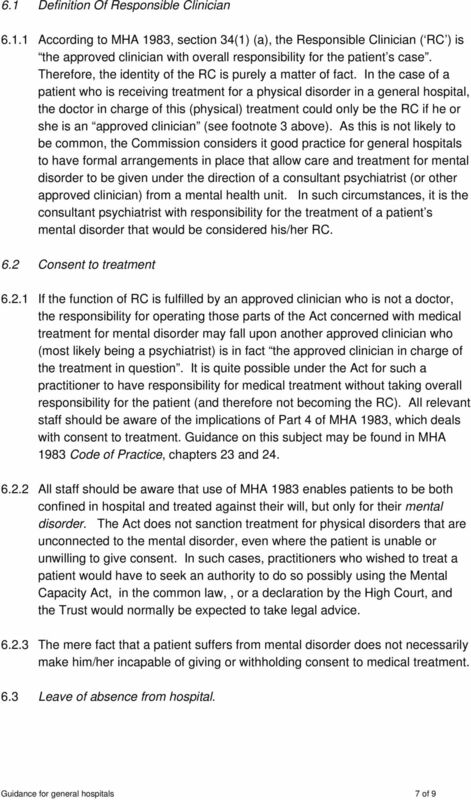 In such cases, it will usually be appropriate for the mental health service to remain the detaining 1 2 The Care Quality Commission is aware that many general hospitals have mental health units, either on the same premises or elsewhere within their Trust, or close links with a mental health trust. 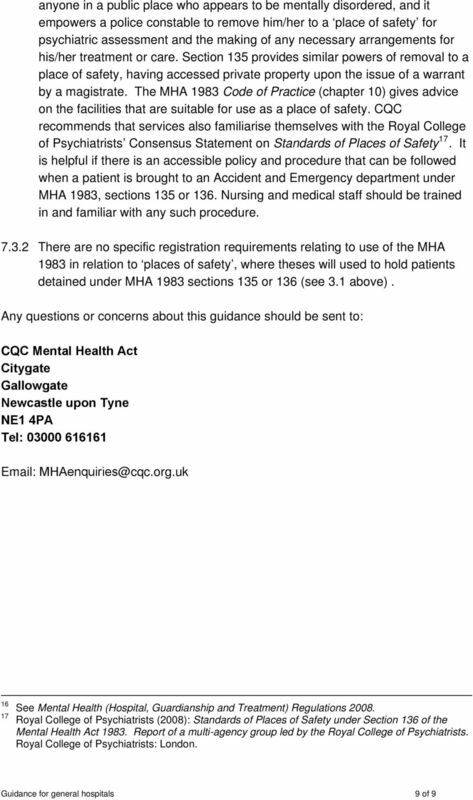 There are, however, a number of general hospitals that do not have such facilities, and it is to the staff of such hospitals that this Guidance Note is primarily addressed. 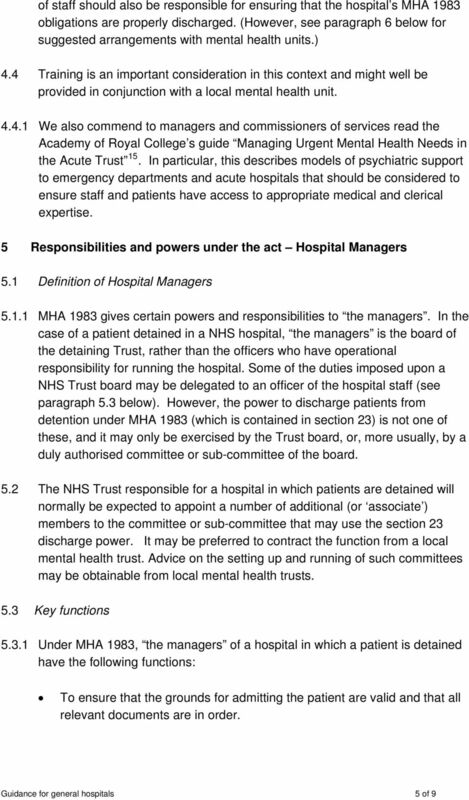 In a survey of 20 Trusts in a single NHS Executive region conducted in 2000/01, the Mental Health Act Commission (the functions of which transferred to the Care Quality Commission on 1 April 2009) found that 17 Trusts reported uses of the Act. Fifteen Trusts were able to provide statistics and in a period of one year had used the Act on 66 occasions - 32 uses of Section 5(2); 24 uses of Section 2 and 10 uses of Section 3. 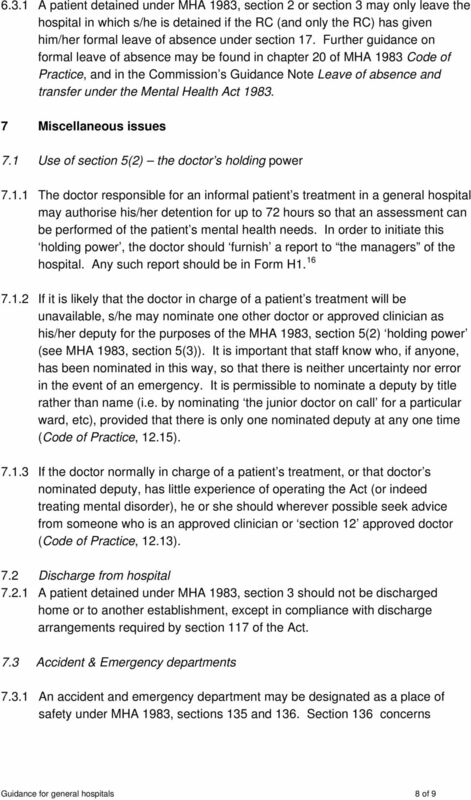 More recent visits to general hospitals by CQC Mental Health Act Commissioners have also noted the Act being used to detain patients. 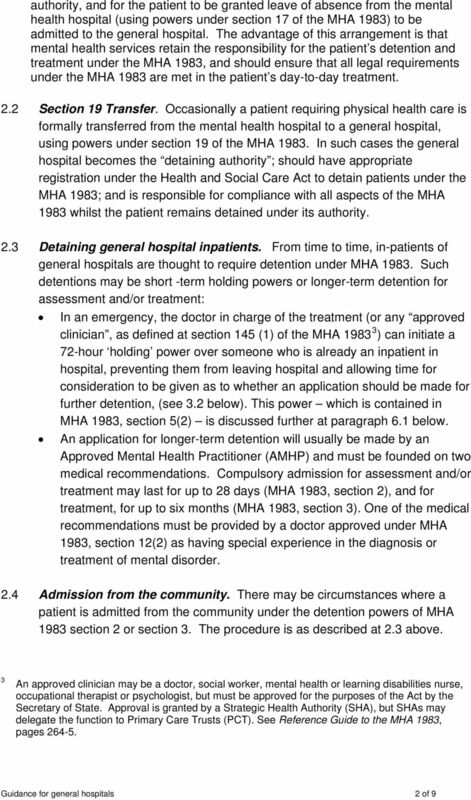 Detention under the Mental Health Act and Deprivation of Liberty what is it and how can it be challenged?